Editor’s note: All the images and links, below, were added by WTS-com. 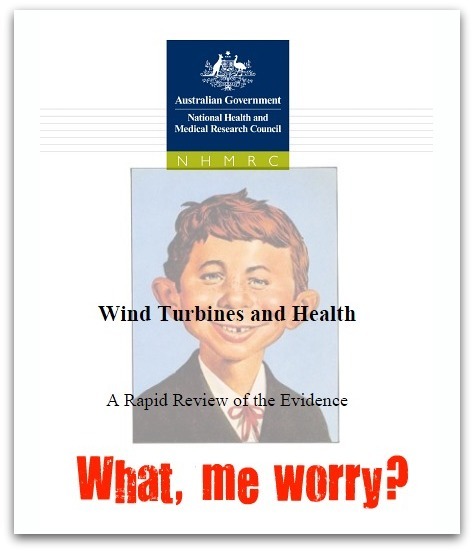 A National Health and Medical Research Council (NHMRC) report dismissing concerns about wind turbines was a “pitiful and dubious document” that misrepresented research and relied on industry-funded reports, a Senate hearing was told yesterday. 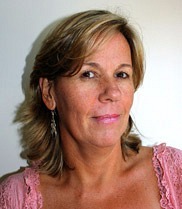 Nina Pierpont, the US-based physician whose research led to the term Wind Turbine Syndrome, said the NHMRC report relied on statements by government departments and wind industry lobby groups and was not a credible report. click on Alfred E. Neuman, above. The NHMRC public statement published last July has been widely quoted in submissions to the Senate inquiry into the impacts of wind farm developments in regional areas. The NHMRC report said there was “presently no published scientific evidence to positively link wind turbines with adverse health effects”. Dr Pierpont said the US National Institutes of Health had referred to “real scientific articles” that took “quite a different view of the physiological effects of infrasound and the potential effects of proximity to wind turbines on human health”. Her wind turbine syndrome includes sleep disturbance, high blood pressure, headaches, tinnitus, dizziness, nausea, rapid heart rate and panic attacks. She recommended more research be undertaken into the effect of infrasound, or very low-frequency sound waves. The Senate hearing was told that, despite requests, the NHMRC had not made a submission to the inquiry. CSIRO social scientists Peta Ashworth and Nina Hall [see here and here and here and here and here] told the inquiry the CSIRO had not conducted any research into the health impacts of wind farms but had relied on a survey of newspaper clippings and the NHMRC paper. They said the CSIRO had not reviewed Dr Pierpont’s work because it had not come up in a search of a database of peer-reviewed work. 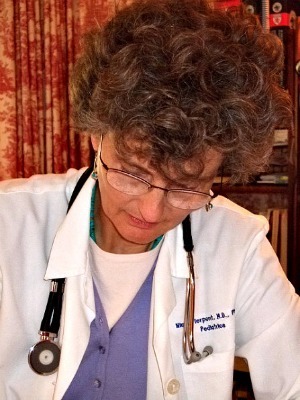 Dr Pierpont told the inquiry her work had been published as a book with peer reviews. Family First Senator Steve Fielding asked whether the CSIRO had “a vested commercial interest” because it was supplying smart load technology to wind energy companies. Ms Ashworth and Dr Hall said they did not know. I live near 86 IWTs (Industrial Wind Turbines) in Ontario, Canada, when I dont live in Sydney, Australia, and I know people who suffer WTS, possibly myself included. Health effects caused by windturbines are painfully, tragically real, and have been ignored by governments, industry and, often, by national and local health departments. But this new field of research is increasingly more widely documented and peer evaluated. I laud and cheer the pioneering work done by Dr Pierpont and her colleagues Nissenbaum, McMurtry and Laurie, whose collective work is making not only a current impact; it will make a permanent difference to government regulations in the wind industry in favour of the health and safety our citizens. Tomorrow Dr Sarah Laurie will personally address the Australian Senate on the same question. Perhaps the Senate is now ready to hear her. What an outrage! Hope I live long enough to see them all go broke—from the lawsuits and the expense of eventually taking them all down. Nina, you gave it your best shot; I guess we are all doomed to man’s stupidity. Eventually your work will be recognized as having led the way. Falmouth Boards, their staff, as well as Acting Town Manager, Heather Harper are at their wits end. The Falmouth turbine(s) have introduced town hall to a harrowing litany of complaints. The issues cover a wide array of concerns, none more significant than the health and well being of neighborhood residents. The study and research being conducted by town hall is a lot to digest. The “experts” told Falmouth that it was unlikely the impact would be more than minimal. Recommendations were implemented. The boards and officials are now posing questions to those who made recommendations. Falmouth is scratching it’s head. The “experts” initial summary couldn’t have been farthest from the truth. The remedies to complaints have been found to have no ready reference guide, or authoritative body to which to turn for answers. This is becoming more and more apparent as a big question mark looms over all turbines. Frustrated with the enormous learning curve and time requirement, town hall’s sentiments are that the “experts” aren’t expert at all. Siting recommendations may very well have been spawned from a concept having little practical scientific protocol. Proper scientific investigative protocol seems marginal, at best, as emerging research trends toward caution. After their installation, these industrial sized turbines are cause for neighborhood outcry. Falmouth is, by no means, unique to this debacle. It’s only one example that has given a local face to what has long since been “out there” in Europe, the UK and New Zealand. It’s been known that there’s just too much scientific uncertainty. The local boards, the Cape Cod Commission, the State, the US Departments of Energy and Environmental Protection have no where near the science to completely pin down answers to these issues and complaints. Why, you might ask? Here’s a possible excuse. Liz Argo, a Cape & Vineyard Energy Cooperative wind advocate, has stated that sound studies done in Brewster are relative to the infrasound levels, as well as sound levels and the aerodynamic amplitude modulation. Those in her capacity, illustrate that the experts and proponents, appearing convincing, mislead and misrepresent with their touting all is hunky-dory with the turbine siting process. She stated on WGBH radio, “in the Brewster study, everything (infrasound test) was so low, in terms of the neighbors and (the) boundary periphery, it’s just not realistic to bring forward the concerns we’re seeing in Falmouth and taint this really valuable project”. She added“we’ve learned, we know why Falmouth has problems, so we must dispel fears and be honest that there are some good projects too”. The truth. The reason(s) for Falmouth’s noise problems remain unsolved! Another truth. Looking at what was measured, or modeled for infrasound in Brewster, in terms of whether there will be harm or not, is flat out impossible! Standards for acceptable infrasound levels aren’t even in the books to apply! No rigorous consensus of science, involving the full scope of wind turbine sound effect, to say nothing of standards, exists! There is no way to evaluate Brewster, in light of what is or isn’t happening in Falmouth. Falmouth’s experience merely serves as an example that current definitive siting standard the “experts” point to are rubbish. The “bet” might work in Brewster or Dennis. At the same time, the “bet” may be another Falmouth in Bourne or Wareham. Is this mumbo-jumbo worth the gamble of taxpayers safety and money? Do you feel lucky? The card that Governor Patrick is hoping to play is the wind siting reform act legislation. His policy agenda would have 2000 mega-watts of power by 2020. One third of this wind power will come from on-shore land based generation. The Patrick Administration acknowledges that Cape Cod is crucial to the Governors wind agenda. It can be implied the agenda would stall without Cape Cod’s participation. A National Public Radio (NPR) correspondent asked a Patrick administration representative specifically about the Falmouth problem. The state is involved and working on solutions with the town (Falmouth), so it was explained by the administration spokesman. The spokesman further mentioned that the state isn’t clear about Falmouth’s need, and that they (the state) can’t make any sort of determination. Is this the kind of state intervention board members, town and county officials are willing to accept? Falmouth town hall folk aren’t too keen on this political posturing. The state renewable policy agenda saw fit to enamor Falmouth with a “green” giant. Where’s their follow-up guidance and help? Meanwhile, neighbors ask the local boards for answers, for relief. Officials can only point to what “experts” said shouldn’t be happening. Yet, proponents, advocates and pseudo experts continue to cluck out their quasi-truths. Since 2008, the state has had on the books, a by-law towns can look to as a regulatory guide for siting turbines. It calls for a special permit process in ALL siting involving turbines 1 mega watt or greater. Listen up Brewster! That being said, in January, state Rep. Demetrius Atsalis, D-Barnstable, proposed a bill requiring a 3,000-foot buffer between turbines and homes. How far is far enough? Mr. Atsalis, taxpayers near proposed turbine sites want science backed setbacks, We’re done with the hocus pocus or another “dead man’s hand”. Assurance is what is expected and demanded. State Rep. Susan Williams Gifford, R-Wareham, filed a bill in January to create a commission to study the effects of wind turbines on nearby residents’ health. It is the best display of ‘sense’ so far, all be it late. This bill reflects the concerns of Falmouth, as well as other areas of the state where land-based turbines are being considered. “Before we rush into doing these massive projects, let’s make sure that we have the best interests of the people of the Commonwealth at heart first,” Gifford said. “Then we can move forward.” Amen Sister! The boards, town and county officials are right to be so angry. Be angry at the folks, posing as experts and advocates. Be angry that plans are being drawn to legislate more “bets”, more potential problems for other communities. The “bad guys” are not those in my company that blow the whistle and call “foul”. It’s a very simple principle of democracy, as well as the glue of a humane society. Representatives, at all levels, should demand the public be protected with certainty. Cape Codders, should press policy makers to stop the non-sense, stop the betting with peoples health and the enjoyment and value of their property. The Commonwealth hesitates with casino issues. Until science can quantitatively substantiate adequate address of wind turbine effect, the gamble of an ill sited wind turbine should have no place in the halls of municipal or county government, let alone residential areas either. That’s telling them! Hurrah for Nina! Now, if only she could persuade Maryland’s Governor O’Malley that building an array of wind turbines offshore in the Atlantic would be economically extravagant and ecologically unfriendly. Editor’s note: Mr. Goellner is the Emeritus Director of the Johns Hopkins University Press. Having arrived back to my 27 Ridgeview Drive home after six weeks away, this afternoon around 3PM was the very first time I went outside. There was the dastardly noise from your Wind Turbine #1 to drive me back inside. I cannot stand this sound. As time has gone on it only gets worse and it causes me immediate distress and anxiety. I continue doctoring with these ailments. I do not know the status of Wind #2. As far as I know it has not yet gone into operation. Since I have been home and looking out of my rear windows where I can now clearly see three giant turbines, I have not seen Wind #2 rotate. Just having to wait for it to start up, the anticipated detrimental effects on my property and my health in conjunction with the already overwhelming effects of Wind I is enough to put me over the edge. These machines are not suited for residential areas. This is a hard and now well-known fact. If the town persists in operating these machines, my letter writing and broadcasting of Falmouth’s failure to protect the health and rights of its citizens will be known the world over. The Chamber of Commerce might as well shut down. The Health Agent and Health Department will be the next to go to court over this. Our health has suffered irreversible damage as a consequence of living too near these machines, while Falmouth’s Health Department acts as if they could care less as they outright ignore our pleas. We have tried to be congenial over this issue for far too long.